It is early March and the ice floes of Eastern Canada are a breathtaking vision: an endless sea and sky filled with white as far as the eye can see. In one of nature's most beautiful spectacles, hundreds of thousands of baby harp seals call out to their mothers, alone on the ice for the first time. But then the sealing ships arrive. What was once a scene of peace and innocence becomes a makeshift factory of terror and cruelty as the ice is covered in blood. These helpless baby seals, some as young as two weeks, are clubbed or shot to death for their fur. Many baby seals will even be skinned alive or will die trapped under the ice after being injured. The International organizations risk the lives of their members each year by going to the ice to film the hunt, documenting the cruelty and sharing the truth about the seal hunt with the rest of the world. But this year Canada's Department of Fisheries and Oceans (DFO) is trying to make it nearly impossible to document the hunt by increasing the distance legal hunt observers must remain from sealers from 10 to 20 meters. The government would rather turn a blind eye than let the world see firsthand the many documented cases of clubbed and wounded seals being left to suffer. So as to stop this crime, Animal Friends invites to the International Day of Action, which will take place on Tuesday, March 15, in Zagreb, Croatia, with the beginning at 11 A.M. in front of the Embassy of Canada, Gjure Dezelica 4. 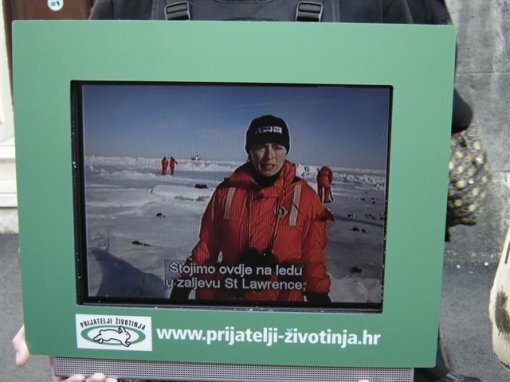 On this occasion the Croatian model Fani Stipkovic will hand a protest note with an appeal to end the seal hunt to the Canadian Ambassador, Mr. Thomas Marr. Also, on the body screen, one of Animal Friends' activists will for the first time in Croatia show the Humane Society of the United States documentary "Bearing Witness: Canada's 2005 Seal Hunt," which last year won a "Panda" Award at the international wildlife and environmental Wild Screen Film Festival in the United Kingdom in the campaigns category. The Republic of Croatia showed a high ethical degree and consciousness by banning the commercial import of skin and other products derived from harp and hooded seals in March 2006. Belgium is at the moment the only European Union country that implemented a national ban on the import of all seal products, while Germany also plans to move forward with plans to implement a similar ban, no matter where the EU policy stands in this issue. Croatia, on its behalf and according to its capacity, legally protected the seals. However, the lobbying efforts to European countries in an effort to close Europe as a market for this blood-soaked products continue. No matter what picture the Canadian authorities try to present to the world, the seal slaughter cannot be justified. Seals are facing their extinction not only because of the greed for their fur, but because of the new threats seals face from global warming, which is destroying the ice that harp and hooded seals require as breeding and nursing habitat. Therefore the protest in Zagreb will not be held only as part of the "For Croatia without Fur" campaign but also as a support to the world efforts and encouragement to the majority of Canadians who are opposed to the hunting of seal pups under any circumstances and justifications. Contact your MPs and MEPs!